If you are a High School Student, this event is for YOU! Have you ever seen a robot that moves on its own? Have you ever thought of building one YOURSELF!? It’s time to do it! 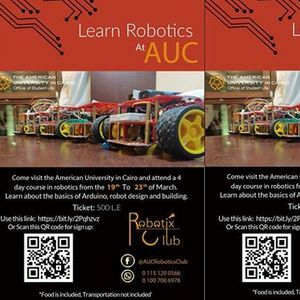 AUC Robotics Club is holding its first School Program where students get to learn the basics of Robotics field and build a line-follower robot themselves! Students will be divided into groups of 4 (you can form your own group) and each team will be supervised by one of our trained instructors. 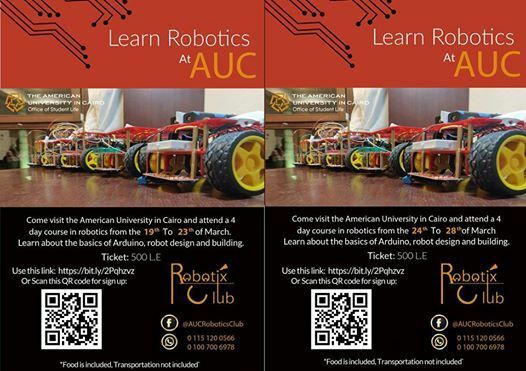 Sessions and workshops will be given for three consecutive days. In our last day, we will have our closing ceremony where each team will be assigned a certain topic to research on and present it to the audience. Each student will have 2 free invitations where family members can be invited to attend the presentations. Finally, a competition will be held between teams and the winning teams will receive prizes that are still to be announced.